624 pages | 30 B/W Illus. 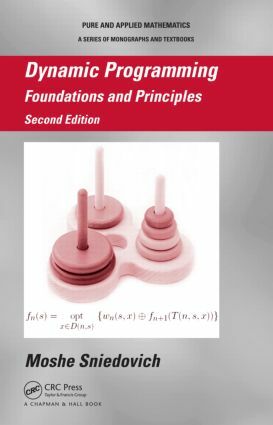 Incorporating a number of the author’s recent ideas and examples, Dynamic Programming: Foundations and Principles, Second Edition presents a comprehensive and rigorous treatment of dynamic programming. The author emphasizes the crucial role that modeling plays in understanding this area. He also shows how Dijkstra’s algorithm is an excellent example of a dynamic programming algorithm, despite the impression given by the computer science literature. Taking into account recent developments in dynamic programming, this edition continues to provide a systematic, formal outline of Bellman’s approach to dynamic programming. It looks at dynamic programming as a problem-solving methodology, identifying its constituent components and explaining its theoretical basis for tackling problems. What Then Is Dynamic Programming? Moshe Sniedovich is a Principal Fellow (Associate) in the Department of Mathematics and Statistics at the University of Melbourne in Australia. Dr. Sniedovich has worked at the Israel Ministry of Agriculture, University of Arizona, Princeton University, IBM TJ Watson Research Center, and South Africa National Research Institute for Mathematical Sciences. He earned his B.Sc. from Technion and his Ph.D. from the University of Arizona.